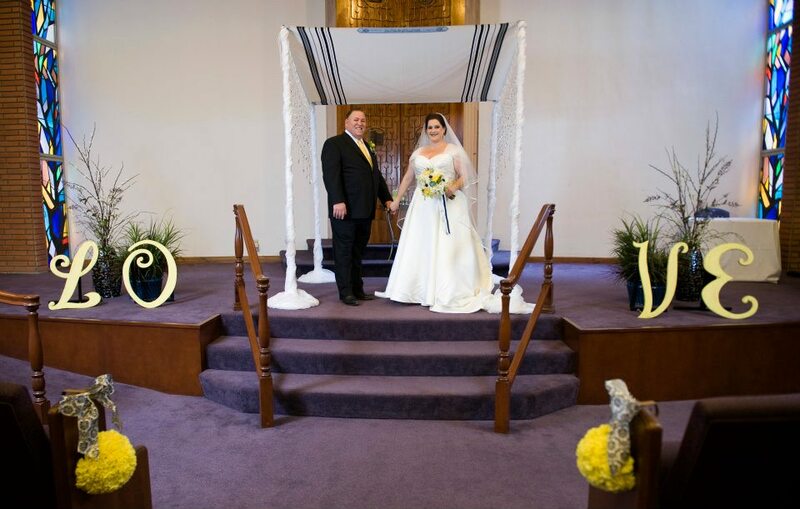 Bride Judy and Groom Jeff grew up together and then went their separate ways only to reunite 35 years later. 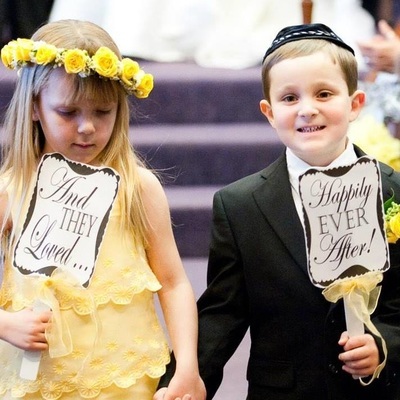 How did you get onto the show “YES TO THE DRESS”? 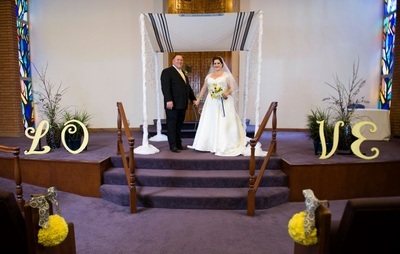 Jeff asked me to marry him in April 2011 (just three short months after reconnecting - we grew up together and then had about a 35 year hiatus!) As it turned out, my brother and sister-in-law who live in NY were having a dual 50th birthday bash in the City AND, a good friend of mine (in pictures at Kleinfeld), Kristina, was going there too for a family reunion. As we were planning we thought, wouldn't it be a kick to go to Kleinfeld to simply try on dresses to get some ideas on what I wanted for my wedding dress? With that thought, I called and made an appointment. 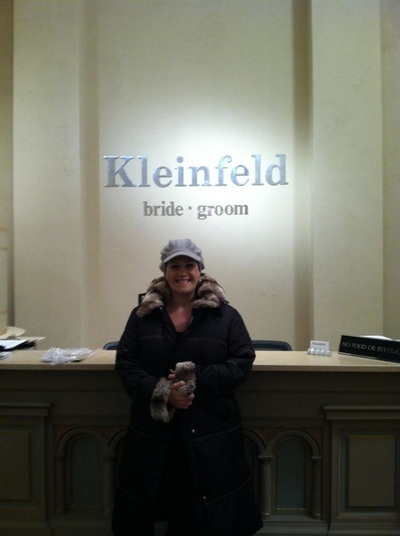 You cannot walk into Kleinfeld on a whim and try on dresses - everyone must have an appointment. Once the appointment was made, I invited my sister-in-law, Lauri to come and give input as well. 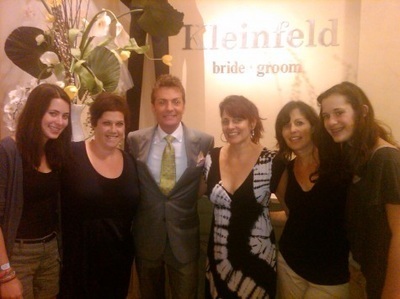 So, in June 2011, Kristina, Lauri, and my two nieces Anna and Julia all showed up at Kleinfeld to take part in my wedding dress journey. Kristina and I arrived first and checked in at 9:45 a.m. on that cold and overcast day in New York. As we checked in, a woman came from around a corner and introduced herself as Anna Sang Park, the producer of Say Yes to the Dress. She said that they read my appointment application and wanted to know if we'd like to be featured on the show! After the initial shock, we agreed. 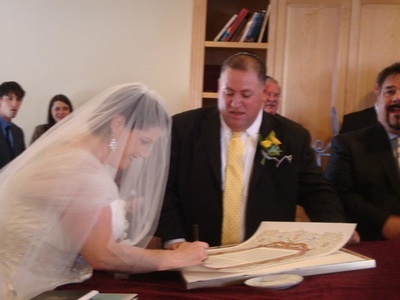 We felt that this was meant to be in this process of me finally getting married at 45. 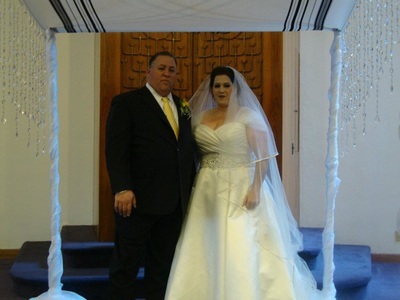 Another aspect was that I had recently lost a lot of weight due to gastric bypass surgery and I was at a point that I could actually wear a wedding dress - a dream I never thought possible. They explained that this would require this filming, a fitting filming, and they wanted to come to Long Beach for the wedding. I called my fiancé at the time, Jeff, and asked him what he thought. Of course, he was on board if I was on board. It wasn't that we WANTED to be on the show, but rather, why not? We were not controversial or were going to convey any negative image, so why not share this amazing adventure with viewers on TLC. After getting all mic'd up and feeling like we signed our lives away on what felt like escrow documents, we were whisked into the ethereal world of Kleinfeld. It is truly that, ethereal. The shop is the most beautiful place I've ever seen - you truly feel like the wedding world is heavenly and as beautiful as any celebration. There was a full set of production staff covering my friends and family sitting on the infamous couch in front of the stage where you show your gown. I had one camerawoman following me around and helping me through the process. I was more concerned with her shooting anything around me changing dresses – she promised that nothing questionable would show on TV! First, I tried on a straight, form fitting ivory gown that had beading and lace on it. Nope – my friends and family were not impressed! So, off that came. 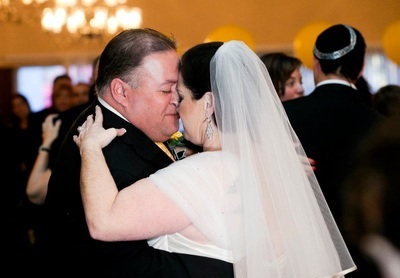 The second dress was a Lazaro gown that was in a beautiful taupe color – very different for the bridal category but very becoming for an “older” bride (I was 45). 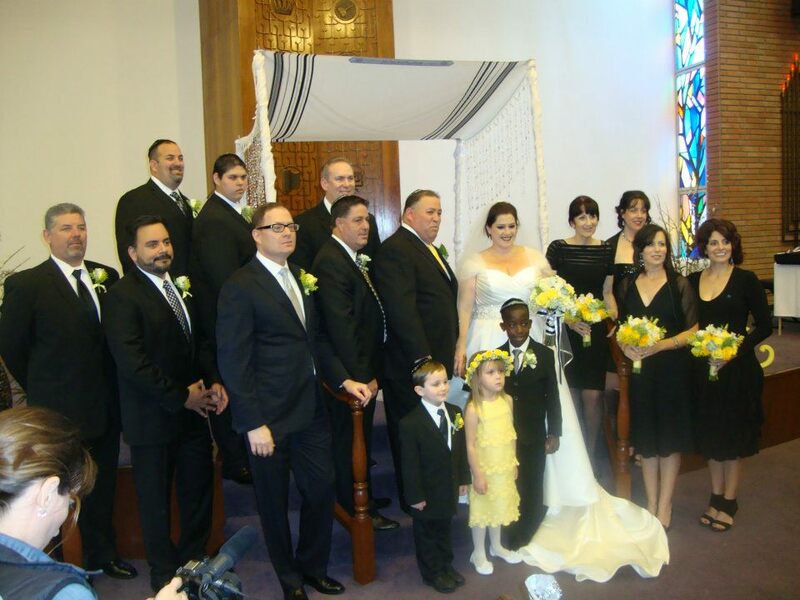 However, when I came out, everyone agreed that they liked the dress but hated the color. It made me look like I had jaundice. Antonella was my consultant (and amazing!) and she brought Randy over to comment. I have to say that as a team, they are brilliant! Randy is the nicest man – funny, handsome, sincere – the whole package. 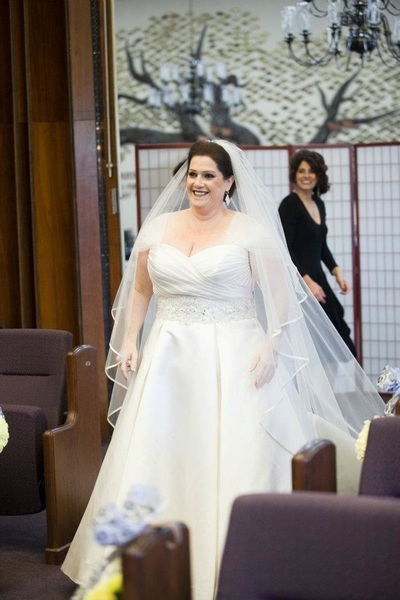 The gown had a sweetheart neckline, a beaded waist, and a princess cut. It was perfect, but the color was awful. What did Randy do? He went in the back and brought out another gown that looked the same but in ivory. As we held it up in front of me, it shined. 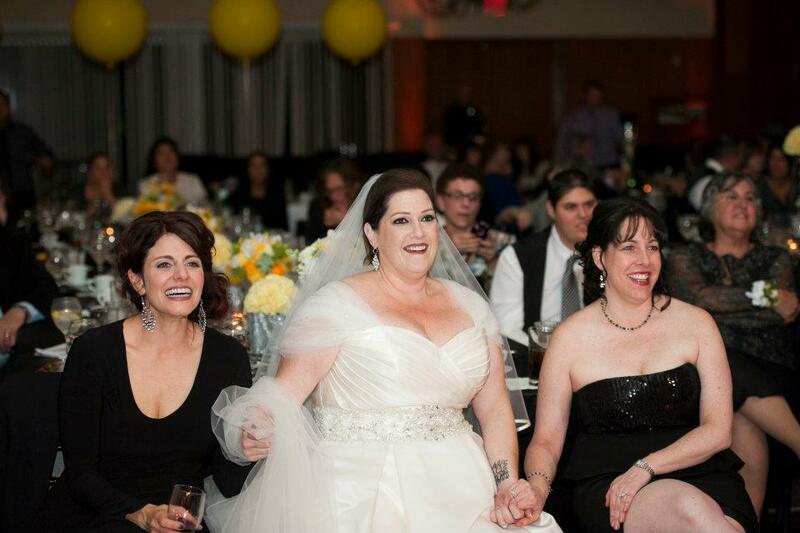 My friends and family hurried me back in the dressing room to put the gown on. It was gorgeous and the color made all the difference in the world. 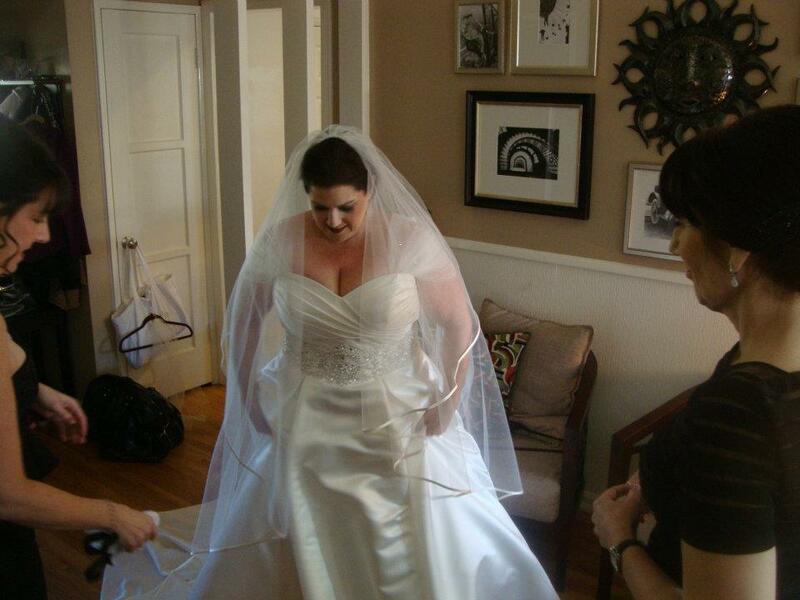 It was shaped perfect and who knew how much a wedding dress hides all the trouble spots! 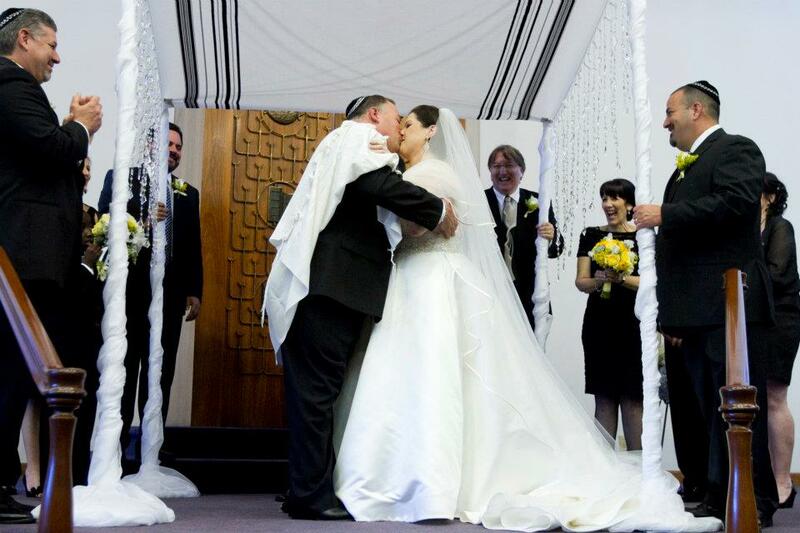 I was amazed at how beautiful it was to be in a wedding dress – it’s dreamy. How was it selecting a dress under the pressure of the show? - When I came out, they were in tears and that made me break out in tears. At that time Antonella and Randy asked me the famous question, “Are you saying yes to this dress?” Well, I was, but I was crying for another reason. A little more than five years prior my parents passed away. 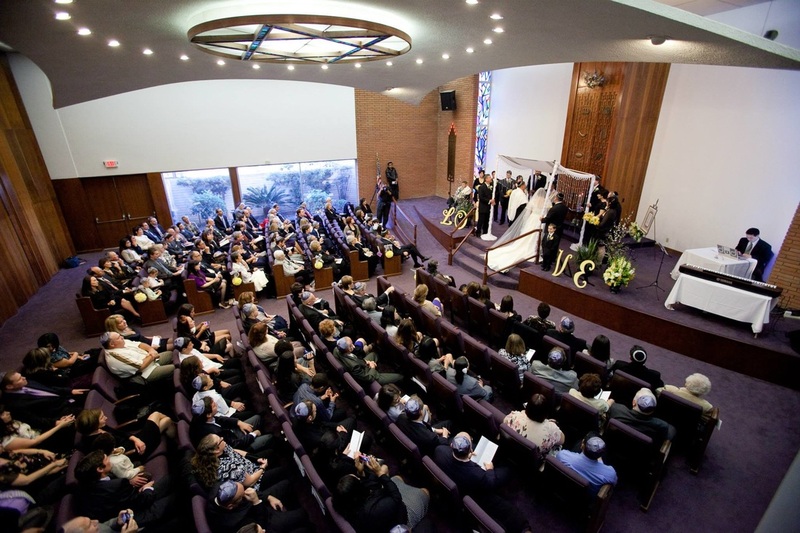 I was crying because I felt like they couldn’t see me, I felt like I needed my mother there to give her blessing of my choice – this was a turning point for me in my grieving process that hit me so hard I wasn’t able to verbalize. After Randy helped me regain composure and we chatted briefly, we continued with the “show” portion. We “rewound”, they asked me again, and after putting a Lazaro veil on, it was the moment – I said “YES” to the dress! 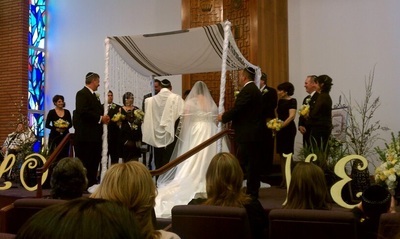 It was an Elida Graham for Kleinfeld gown that mimicked the Lazaro gown. In the end, we taped the show in three segments – the shopping and ordering in June 2011, the fitting in December 2011, and the wedding in March 2012. We had to go back to New York in December for a “power fitting” where I paid extra money to be there for an entire weekend at their beck and call. Friday was the fitting, Saturday another fitting, and Sunday a final fitting. They do all the work over the weekend. 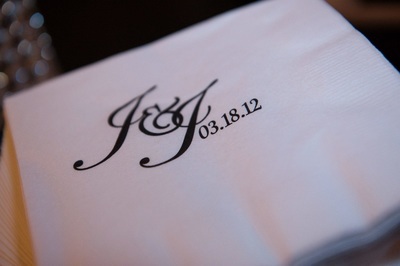 After that, the gown was shipped home. Sunday, March 18, 2012, the crew of SYTTD flew to Long Beach to tape the wedding from wake up to end of the celebration. One crew trailed Jeff and his friends and one crew trailed me and my friends and family. They filmed us getting ready all the way through – it was really fun for everyone. One question we always get is a misnomer that my dress was free for being on the show. Nothing was free and we didn’t receive anything for allowing TLC into our marriage process. It was the experience and the ability to memorialize the event through the eyes of the television audience. Everyone had so much fun being involved – it’s truly reality television!